The background of these two industry gurus is extensive with Skip Cohen’s CV features companies like Polaroid, Rangefinder Publishing and President of Hasselblad USA. Scott Bourne is the founder of Photofocus.com which has a blog readership of over 100,000 photographers and a podcast download 4 times that per month. Having won numerous awards and worked in many different field of photography from studio to wildlife (with bird photography as is speciality) Scott Bourne has a wealth of knowledge and experience as a working professional. 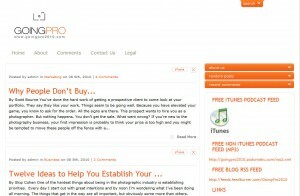 Going Pro 2010 is one of the most informative sites and podcasts around and will only offer insights into the world of professional photography.